After making an impact with his track, ‘My Love’ – now heading to the top of the UK singles charts – and producing a track for Katy B’s ‘Little Red’ album, 19-year old Route 94 is back with his debut ‘Fly 4 Life’ EP on Defected Records. Sultry female vocals and 808 rim shot groove in the opening track, ´Tell You Why´, combine a touch of R&B and effects heavy vocals, creating the ideal track for dancing in a club or your living room. The EP’s title track, ‘Fly 4 Life’, opens with a captivating bassline, while the lusty vocal samples and massive white noise sweeps switch the track flawlessly between classic soul house and shadowy techno. ‘In My Heart’ and ´Walls Come Tumbling Down´ highlight the young producer´s deeper side showcasing warm bass synths, ethereal arpeggios and hypnotic vocal hooks. 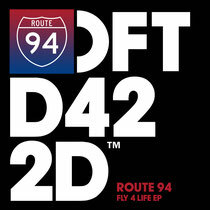 Already celebrated by the likes of Annie Mac and Skream, the EP should help solidify Route 94’s reputation as an international house staple. It’s out 31 March, check it out below.